Greater Noida : Team Dirt Marshall of UPES, Dehradun comprising of 25 mechanical and automotive design engineering students showcased an innovative all-terrain vehicle, all conceptualized, designed, developed and manufactured by them, at the on-going Auto EXPO. The all-terrain vehicle earlier emerged as the winner in the ‘Sledge Pull’ competition at BAJA SAE India in 2017, where it managed to grab eyeballs nationally. It secured 1st Rank and cash prize of INR 1,00,000. 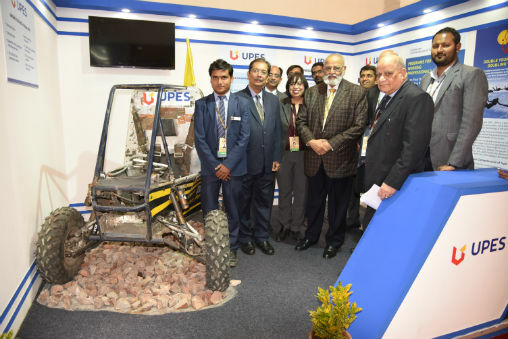 The UPES stall where the all-terrain vehicle has been displayed was inaugurated by Dr. Abhay Firodia, Chairman, Force Motors Ltd. & President, SIAM at the EXPO. The machine is a race off-road vehicle that can withstand the harshest elements of rough terrain. It is similar in appearance to dune buggies. The 4-wheel drive machine gives a high torque and better traction. It is also compact with only 50″ wheelbase and has cutting brakes applied on rear wheels. It also has a whole chassis made of 4130 chromoly steel, aluminium wishbones and titanium steering rack. It also has a hanging hammock seat that would reduce mounting weights. This vehicle would cost approx 4-4.5 lac per vehicle during the mass production and can be a saviour for people living in difficult terrains. Currently, it is a concept vehicle that is in its elementary phase of functioning. If brought into commercial production, it would bring in radical change in the lives of those living in the harsh terrains of the country. UPES is a Dehradun based university which offers industry-aligned graduate and postgraduate courses through its five schools- School of Engineering, School of Computer Science, School of Design, School of Business and School of Law. The programs offered at the university are focused on high-growth sectors such as Oil & Gas, Power, Infrastructure, IT, Design, Planning & Architecture, Public Policy and Legal Studies.